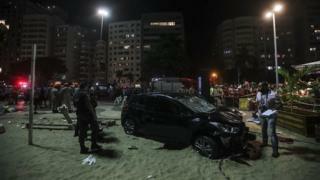 A car has ploughed into crowds on a promenade near Rio de Janeiro’s famous Copacabana beach in Brazil, killing a baby and injuring at least 15 people. Live television pictures showed victims lying on the sand and pavement, receiving emergency medical treatment. The badly damaged car came to a stop on the beach. The driver, who was detained, had an epileptic fit at the wheel, and drugs to treat the condition were found by police in the vehicle, reports say. Eyewitnesses were quoted by Globo News network as saying the car went over a bicycle path and across the promenade, hitting people and crashing through the tables and chairs of a cafe. A police official was quoted by the AFP news agency as confirming the accident was not a terrorist attack. The promenade of Copacabana’s crescent-shaped beach is popular with Rio residents and tourists.